I re-travel the route to Harris today, this time heading for West Harris and Luskentyre to meet Donald John Mackay. South of Tarbert the rocks seem to have burst free of the green that bulges in telltale lumps elsewhere, and the landscape is strewn with boulders. The road narrows to a single track and, in its ageing worn and grey surface, is almost swallowed up by the hills. I dip and climb, with hardly a car on the road, skirting into the half-moon passing places if another does happen along until, on pulling over a summit, suddenly the sweeping bay of Luskentyre opens up before me. White sands spill like a carpet of pearls reaching far out into the bay, the shallow waters of low tide a glistening azure, and the purple-black hills tumble around the edges. A few small islands hover on the horizon at the far side of a white sandbar that stretches across the bay. The frustration of driving is that at every turn I want to stop and capture the moment in a photograph, but there is nowhere to pull off the road, just the peaty grass verge that extends to mountain. Donald John lives in a house on the edge of the bay, down a road just the width of my small car, a minor road to the single-track road from Tarbert. Donald weaves tweed in the green shed beside his home and the clatter of the old treadle loom spills through the air as I approach. A soft subtle smell of sheep and soil permeates the little shed and I am struck by a sense of how the very earth seems to be in this room, through some unbroken chain to the past. Dimly lit and stacked high; I position myself carefully with my camera and recorders, tight between the wooden door and the heavy dark loom, careful not to knock any of the many obscure items filling the space. Donald has used this same loom for over 30 years and he tells me they get on very well indeed. Each loom has its own peculiarities, he says, and is unique to the weaver. 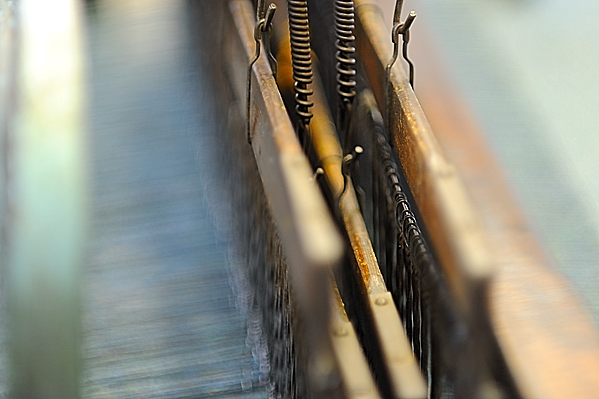 Weaver and loom can be in harmony. Donald started by helping his father from a very early age. It’s not a job, he tells me, it’s a way of life that has been carefully protected and handed down. The Harris Tweed weavers are some of the last weavers working pedal powered looms. They are the custodians of that heritage and Donald feels a great responsibility to his role. Though the weaving was not popular for a period, more young people are now weaving again, supported by the local council and weaver training classes. To be called Harris Tweed the tweed must be woven in the home and by manual foot-pedal power, the colours of the tweed reflecting the seas and the landscape of the islands. The definition of Harris Tweed is now protected by an Act of Parliament. Everyone on the islands used to have a loom in the home for the making of their own clothes or use around the croft. But in 1846 Lady Dunmore of Abhainn Suidhe (Amhuinnsuidhe Castle), widow of the landowner of Harris, had their clan tartan replicated in tweed, introducing it to people she knew and wearing it for hunting and countryside pursuits. This was the start of commercial trading for weavers on the island. Donald has become known across the world as a master of Harris Tweed weavers. His cloth is sought out by tailors from Savile Row, who travel from London to his remote bay to choose their tweed. Tomorrow it is Austrian TV that is coming to visit. After a lovely morning, capped with tea and biscuits, I head back along the winding road to Tarbert to meet with Calum Mackay, Chair of North Harris Estate and Deputy Head at Sir E Scott School. I pass a pleasant couple of hours meeting some of the children at the school and learning about the estate. Today the 62,500 acre (253 km2)land (but not the castle building itself) of North Harris Estate is celebrating its tenth anniversary of community ownership. In Scotland, the Community Right to Buy allows communities with a population of less than 10,000 the opportunity to buy land from landowners when it comes up for sale, with financial help available from a community land fund.Communities not only take control of environmental wellbeing and preserving natural heritage, but also develop social and economic benefits for the community. North Harris Estate has a population of around 700, including 116 crofts and 22 townships, with most people living in the town of Tarbert. Owning the land involves, amongst other things, responsibility for the deer herd, protecting the environment, clearing invasive plants and maintaining paths. Estate projects have involved a new social housing development and a recycle centre. Other income generation comes from tourism and renewable energy. The sun is still high in the sky but the afternoon is drawing to a close and it is time to for me move on. Rather than head directly back to Lewis, I make the most of my time in Harris and turn back towards South Harris, taking the turn off to the Golden Road, that runs along the inlets of the eastern coastline. A long slither of pale grey road meandering up and around and down again, through small villages of a few scattered houses, past fishing boats and small rocky islands to the left, and the boulder-strewn moonscape of the hills and lochans to the right. It is late by the time of my return up the spine road to Lewis. It is early morning when I pile myself, the cameras and lenses, the waterproof cover for the camera, the sound recorder and wind shields and microphones, the spare batteries and memory cards, and the little GoPro video recorder, the rainproofs and sunhat and sunglasses, the flask and sandwiches, the suncream and the Avon Skin So Soft, otherwise known as the best midge repellent around…. into my hire car. I am starting to love my little car, bundling it full and steering a course across the islands to the next anticipated destination. Today it carries me under a still blue sky. The sun is steadily warming the day; no breath of wind, just the humming of the bees and the crystal call of the skylarks. I turn left off the road out of Stornoway, heading the thirty-odd miles south for the Isle of Harris, about an hour’s drive. A sign welcomes me to Harris and I cross out of Lewis along the road that runs the length of the islands. With the journey south the flat peatlands of the north fold into ever-more lumpy and undulating hills, finally bursting into an infinite pattern of dramatic mountains, black and rugged, bare to the wild weather that whips around their craggy tops. But today they are glowing in the sunshine, the grass emerald green, sheep wandering at will across the road. To left and right lochs are nestled in the peats, and round every bend in the road another dark peak cuts into the sky. I am meeting with Matt, ranger for the North Harris Estate. North Harris, once under the lairdship of the castle, is now fully owned by the community. A trust, working alongside the crofters, manages the land on behalf of the community. I arrive in Tarbert where the Estate offices are, and I bundle myself and my gear into Matt’s vehicle, to head along a track originally built for the stalkers from Amhuinnsuidhe Castle, and into the hills. We are in the territory of the Golden Eagle, with one of the highest densities of breeding Golden Eagle populations in the whole of Europe; an abundance of open moorland habitat and nesting crags in the hills make a perfect home. After walking up the glen and into the hills for some way, recording the streams and the birds, listening to Matt’s stories of the estate, we turn and head back towards Huisinis beach. The twelve-mile single-track road tumbles and twists over the landscape, but there is no greater surprise than to suddenly travel right through the huge gates and past the large front door of Amhuinnsuidhe Castle. Amhuinnsuidhe means, “sitting by the river” which the castle does, taking advantage of the salmon that return every year from the sea to spawn. It is only a couple more miles past the castle to the shell sand of Huisinis, which sparkles white in the dazzling day; the water is a silent Caribbean blue. Beyond north Huisinis lies Scarp Island, now immortalised in the Scottish film The Rocket Post, which tells the heart-warming story of attempts in 1934 to fire rockets from Harris to carry the mail across. 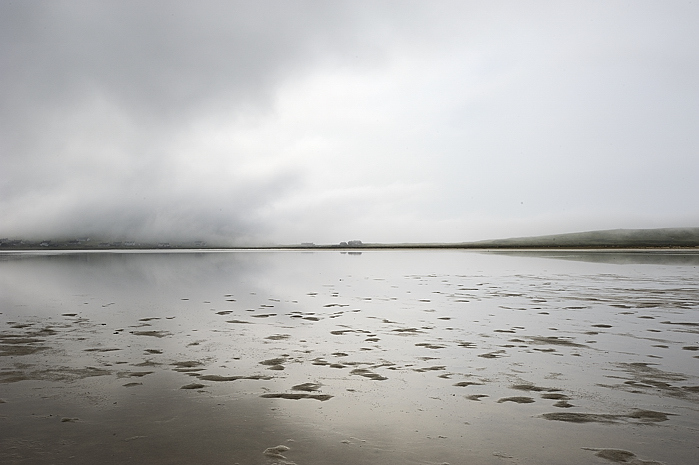 Harris is a place of Atlantic salmon and red deer, otters and seals, eagles and skylarks. In Celtic mythology the Eagle is revered– symbolising the soul, wisdom and age. It seems no wonder to me that so many eagles make Harris their home. In the afternoon I leave Matt and head alone onto the tiny village of Rèinigeadal, along another single track road that dips and turns with every contour of the land, to the end of a sea loch on the east side of Harris. A road and electricity only arrived at Rèinigeadal in the 1980’s and a two-hour walking track, across the hills to Tarbert, was used every week by the children going to school. At the end of a day of recordings and photographs, I finally drag myself back onto the road north, to what already feels like home in Stornoway.